Sure cancer is rotten luck, but it is not just an unpreventable random event! Happy New Year headlines proclaimed that cancer is mostly just due to random bad luck. If only it was true, it might have been a comforting, guilt-alleviating message, based on a Johns Hopkins media release . The supposed good news that cancer is mostly just a random event leaves the impression that apart from common advice like “don’t smoke,” it is no use worrying too much about Prevent Cancer Now’s calls for clean air and water, healthy food and consumer products, exercise and sweating, workplace protections and so on (see Prevent Cancer Now’s personal tips ). In fact, the Johns Hopkins researchers Christian Tomasetti and Bert Vogelstein did not give asbestos or other cancer causing agents a free pass, and the actual study published in Science  does nothing to disprove lists of carcinogens, and clusters of cancers in groups such as workers, around toxic sites, or in various regions around the world. The study was a clever test of a widely accepted theory. Each time a cell divides there is a chance of mistakes in copying DNA, and as these mistakes accumulate a cell is more likely to become cancerous. 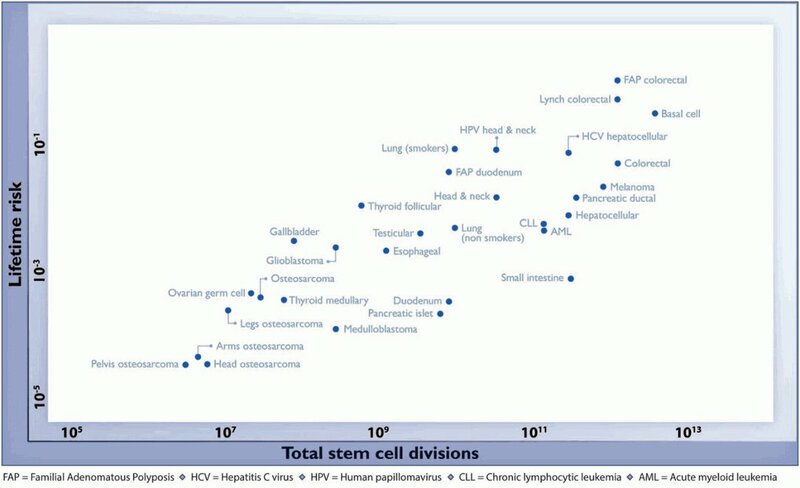 Using existing data for 22 different tissues, the number of divisions of stem cells (immature cells that divide so tissues will grow and be maintained as cells die) was compared with USA lifetime cancer rates. 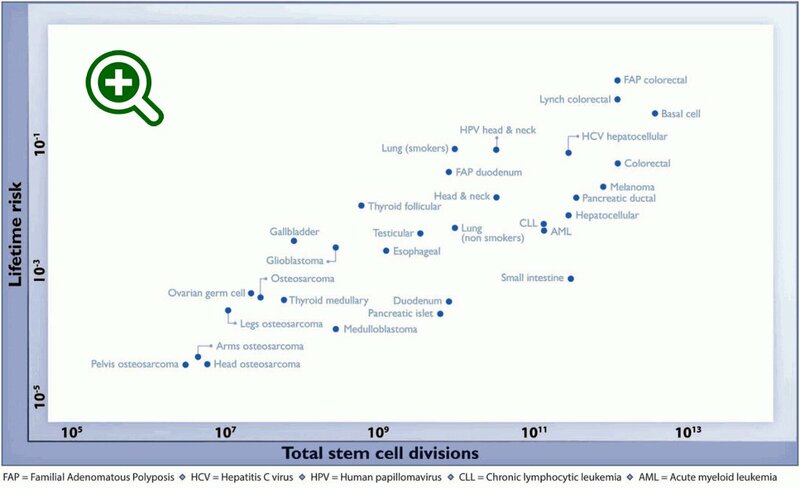 Sure enough, graphing cancer risk versus lifetime stem cell divisions in these various tissues showed a broad band trending upwards – the more cell divisions, the greater the chance of cancer. Breast and prostate cancers, among the most common malignancies, were not included in this analysis because the authors could not find consistent stem cell data. Indeed, the mathematical results were driven by rare cancers, and may well be less relevant to common cancers. So, the long-held theory has merit for stem cells, although American data may vary from other populations’. Typical American exposures are assumed not to contribute to cancer, for at least some of the tissues in the study. In fact, many persistent pollutants, pesticides, radionuclides, radiation from many sources (e.g. medical imaging and communications technologies), common diet choices, etc. – at home, school, work and play – may increase rates of cancer, in many tissues. The assumption inflates the calculated proportion of cancers arising from random chance. Cellular processes can be affected by the way its normal DNA is used. Environmental exposures can cause “epigenetic” changes that cause cells to grow rapidly and not die. Endocrine disrupting chemicals promote cancers in many tissues sensitive to hormones. The lack of reliable data for breast and prostate cells may be related to environmental and laboratory exposures, such as chemicals from plastics. The immune system detects and eliminates aberrant cells, so DNA mutation is only half of the equation. Environmental factors can affect immune function. Inflammation and infection can increase rates of cell division, oxidative stress and rates of cancer. Cancers arising early in life or related to early life exposures (e.g. the drug DES [diethylstilbestrol]) belie this model. A few examples include childhood cancers, lymphoma and testicular cancer in young men, and pre-menopausal breast cancer and thyroid cancer in young women. Importantly, the difference between cancer rates with and without a known carcinogen (i.e. the spread between risks for lung cancer for smokers and non-smokers; and for head and neck cancers, and liver cancer with and without cancer-causing viral infections) is much less than the spread across the broad band of data. This suggests that the data actually indicates that other factors, perhaps unknown and not addressed, are also at play. This is contrary to the assumption that some cancers in the dataset have no environmental contributor. For example, although glioblastoma is listed among the “random chance” malignancies, mobile or cell phone use increases increases glioma risk  and worsens prognosis . The authors conclude that as seen for lung cancer, tissues found along the top of the broad band of data are more likely to have environmental contributors than cancers in the middle or lower bounds that are more driven by random mutations. Prevention activities may be less effective for these malignancies, and the authors propose that early detection (screening) may be a better option to reduce suffering and deaths. Unfortunately, screening doesn’t have a stellar record, as it tends to detect indolent, less dangerous tumours. There is strong evidence of harms associated with over-diagnosis and treatment, with little impact on mortality from screening for neuroblastoma , breast  and prostate  cancers. This study ultimately gives reason to redouble our efforts to identify, monitor and minimize environmental contributors to cancer, and to ensure that we use least-toxic options across the board, and all have healthy air, water, food, and easy opportunities for exercise. Prevent Cancer Now is a Canadian non-profit group working to stop cancer before it starts. 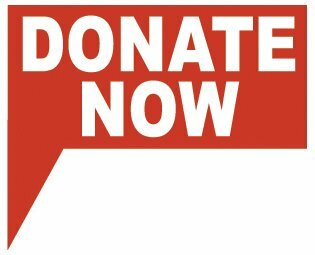 Please consider making a donation  today. Your donations  keep us going.